Welcome to Scarlett Johansson Fan, your online resource dedicated to actress Scarlett Johansson. You may know Scarlett from her roles in "Roung Night", "Lucy" and her 8 years as Natasha Romanoff / Black Widow in the "Marvel Cinematic Universe". It is our aim to bring you all the latest news, photos, information and much more on Scarlett’s career. We hope you enjoy your stay! Today (April 24th) Scarlett has two talk shows that she will be on to promote Avengers: Infinity War and the first one she was on aired earlier today and that was the The Ellen Show, She talking about Rose thinking she is a superhero all the time, The movie it’s self and played a game of Last Word with Ellen, At this time we only have three clips that you can watch below and the stills but I am working on finding the full interview for the site and remember Scarlett will next be on Jimmy Kimmel Live tonight. And there will be a new look coming up for the site very soon so keep looking back for that. Yesterday (April 23nd) was the big event the premiere of Avengers: Infinity War in Los Angeles. And Scarlett who was joined by Colin Jost along with the cast of the movie and several other Marvel TV and past film stars on the purple carpet. Scarlett looked absolutely stunning in her silver dress, with a choker Move Addiction from the Messikaby Gigi Hadid collection and purple eye shadow to complete the look. A total of over 270 HQ photo’s of Scarlett from the press line and inside have been added into the gallery and more should be coming very soon. Yesterday (April 22nd) was the kick of for the press tour of Avengers: Infinity War and Scarlett who is showing of her new dark hair look as well as most of the main cast of the movie attended the global press conference at the Four Seasons Hotel, where they talked about the film and there characters for roughly just under a hour. The conference it’s self was hosted by Thor: Ragnarok’s Jeff Goldblum who is not in Infinity War (that we no of). After that Scarlett and the cast went to did some press junket, At this time there are no videos out but some photos people took are so I would guess the videos will come out soon. The full video for Scarlett and Pete’s new song Bad Dreams has now hit youtube. It’s a nice looking video and as much as i hate to say I do not like Scarlett’s other music much at all I do like this song a lot, it much upbeat then most of her others so it has me curious for the others on this EP. You can watch the video below and caps are up in the gallery. Very excited that Scarlett and I got to collaborate on new music again. Our single “Bad Dreams” is out now! Watch the video first on @AppleMusic. Scarlett and her long time friend singer-songwriter Pete Yorn have reunited again for a brand new EP called Apart that will consist of 4 new songs Iguana Bird, Bad Dreams, Movies, Cigarrillo and one remix Tomorrow (Remix). The first single Bad Dreams hit Apple Music and Spotify today with the music video only being on Apple Music at this time but should be released other places like Youtube soon I would think. The full EP will be available on June 1st and no news on how Scarlett and Pete will be promoting the single/EP at this time. You can watch the “Bad Dreams” video Here on Apple music or you can buy it for £1.89 there as well if you don’t have Apple Music. And you can Listen to “Bad Dreams”/ Pre-Order the EP Apart Here on Itunes. Marvel released a new online feature for Avengers Infinity War called 10-Year Legacy, And Scarlett has a little interview in it and some behind the scenes clips from Iron Man 2, Avengers and Avengers Age Of Ultron. Caps are up in the gallery and you can watch the video below. Marvel have released a new set of character Poster’s from the upcoming Avengers: Infinity War for the infinity stones, showing off the different one’s, Scarlett is on the green one a.k.a the time stone with Okoye (Danai Gurira), Black Panther (Chadwick Boseman) and Hulk (Marl Ruffalo). Scarlett is be featured on one of the six Empire Magazine‘s May covers with a all new photo of her as Black Widow along with Iron Man, Captain America and Shuri. I have added the HQ digital scans to the gallery and the issue of Empire is out now you can pick up individual issues from Here. Earth has never needed its Mightiest Heroes more than now. It’s just over a month until Avengers: Infinity War makes its to way to the big screen, pitching Marvel’s entire universe of heroes against the most powerful villain the series has seen yet: Thanos. The 19th Marvel Cinematic Universe film unites all corners of the MCU so far: the classic Avengers line-up, recent additions like Black Panther and Doctor Strange, as well as the Guardians of the Galaxy. To celebrate, May’s issue of Empire is one huge Marvel blow-out: we’ve mixed and matched the roster of characters on not one but six different covers, we’ve got the inside story on Marvel Studios’ most ludicrously ambitious film ever, and the issue also comes with a bonus comic-sized magazine celebrating 10 years of the MCU. Let’s start with the six covers: first up it’s Iron Man and Captain America — the two Earth-bound cornerstones of the Avengers — flanked by Black Panther stand-out Shuri, and Scarlett Johansson’s deadly Black Widow. Next is Doctor Strange (sporting the Eye of Agamotto, aka the Time Stone), accompanied by Scarlet Witch, Drax, and Okoye. Fresh from smashing box office records, Black Panther is on our third cover, shoulder-to-shoulder with Nebula, Bucky (sporting a fetching new arm), and War Machine. The fourth cover is on the cosmic end of the MCU spectrum — three members of the Guardians (Rocket, Mantis, and Teen Groot), joined by a now one-eyed Thor, and with Vision hovering nearby. Star Lord and Gamora are on the fifth cover, joined by Spider-Man in his new Iron Spider armor, Hulk, and Falcon. On the final cover, there’s only room for one Mad Titan. Yes, Thanos has his very own design, flexing his bicep and showing off that shiny gold Infinity Gauntlet bearing two of the Infinity Stones. Four to go. Inside the mag, we got on-set access to Infinity War in Edinburgh and New York, speaking to the likes of Chris Evans, Tom Holland, and a certain Robert Downey Jr. Oh, and we called up Chris Pratt (who may or may not have been in space cooking up Awesome Mix Vol. 3 at the time) for a chat about Star Lord joining the gang. That’s not all — as well as exclusive pics from Infinity War, and a fresh peek at Ant-Man and the Wasp, the new Empire comes with its own extra magazine encompassing a decade of Marvel’s ever-expanding universe. From the origins of the franchise when Iron Man arrived in 2008, to the first time the Avengers assembled in 2012, it’s your ultimate guide to a true cinematic game-changer. If you want to know our ranking of the 50 Greatest MCU Moments, or see a very special re-telling of how the Russo brothers figured our that airport fight in Civil War, it’s a must-read. Scarlett was seen in New York city on March 16th, She shot scenes with her co-star Adam Driver at the 7th avenue Brooklyn train station in New York of her new at this time untitled film by Noah Baumbach. On top of that Scarlett was debuting her new hair colour for the world gone are the light blonde and in is a dark to light brown/red colour that looks great on her. The movie is set for a release date of 30th November 2018 at this time. HQ candids from the day are now up in the gallery and I hope to have more info on the project very soon. The full version of the Theatrical Trailer for the upcoming Avengers: Infinity War at last came out, There was not a lot of Scarlett in it but we can tell from it she will be part of the wakanda team with T’Challa, Bucky, Wanda, Steve, Vision, Hulk, Sam and Rhodes. HD screen caps are up in the gallery and you can watch and then watch again the video below. Thor Ragnarok is now out on Blu-Ray and DVD, and as some may or may not known Scarlett has a little part in it with her video she did for Bruce Banner when he was in the quinjet from Age Of Ultron, We did get to see a little of it in that movie but the full clip was shown in Thor Ragnarok and was a nice little touch. HD Screen Captures from the little part are now up in the gallery for you all to see. The first of the press videos are now hitting the web and Entertainment Tonight is the first one out, They got to do on set of Avengers: Infinity War and talk to Scarlett and Chris about his beard, children and how (not) hot Chris H new look is. Update: ET released the full interview with Scarlett and Chris and its over 11 minutes long this time. Both of them go into more details then the first little interview had in it. Speaking of Hulk, the last time these two were around each other there were the threads of a romance, but it seems that is destined for a less than happy ending according to Johansson. he story follows an unfolding divorce that spans from New York City to Los Angeles. The plot is yet to be revealed. Will be the 4th installment of the 'Avengers' series. A World War II satire about a ten-year-old boy who, ridiculed by his peers and misunderstood by his mother, can't quite figure out how to fit in. As the naïve young German struggles to understand his place in an increasingly Fascist regime, he resorts to an imaginary friend (to be played by Taika) who can offer advice and help him cope. 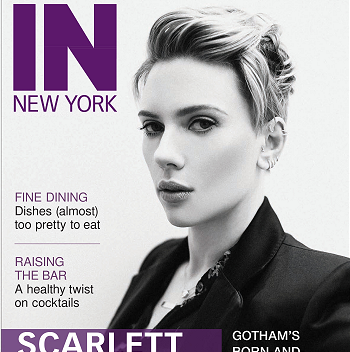 Scarlett is featured on the cover on April 2018 IN New York promoting Avengers: Infinity War . On Natasha and her character "I really like playing Natasha. It's been such an interesting journey to take a character and peel the layers back and be able to, as you do in life, grow with this person" she says. "It's a character that's really enigmatic and has an amazing origins story, so there's a lot for me to play off of""
NOTE: The Links on the photos are for the Amazon US stores only; please make sure to check for product availability and region capability before buying using these links. To view Scarlett Johansson Fan at its prettiest, a screen resolution of at at least 1024x768 in the latest version of Firefox/Chrome is recommended.